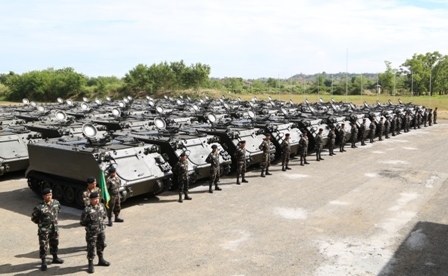 FORT BONIFACIO, Philippines --- The Philippine Army formally received the 114 M113A2 Armored Personnel Carriers (APC) in a Turn-over and Blessing Ceremony at the Mechanized Infantry Division headquarters in Camp O'Donnell, Capas, Tarlac, on Thursday, February 4. Lt Gen Eduardo M Año, the Commanding General of the Philippine Army, received the APCs from General Hernando DCA Iriberri, Chief of Staff Armed Forces of the Philippines during the ceremonial turn-over. Hon Voltaire T Gazmin, Secretary of National Defense, was also present as the guest of honor and speaker. The activity was also attended by the joint staff of the AFP, Army unit commanders, and JUSMAG-Philippines personnel. The M113A2 APCs arrived in the Philippines from the United States last December 9 and 14, with 77 and 37 units, respectively. It was donated by the United States government through the Excess Defense Articles grant. It was then transported to the Mechanized Infantry Division headquarters, where repairs and refurbishment were done. These new acquisitions will increase the fill-up of armored vehicles in the Army. This will further enhance the readiness of the Army's Armor Units, particularly on fire support capability. Meanwhile, the continued acquisition of equipment under the AFP Modernization Program will promote the Army's defense capability, particularly in internal security and territorial defense operations. By 2016, the Philippine Army envisions to be a well-equipped and respected Army in Southeast Asia, and a potent force that is ready and capable to address external threats.